There is an ever-growing interest in control problems today, con- nected with the urgent problems of the effective use of natural resources, manpower, materials, and technology. When referring to the most important achievements of science and technology in the 20th Century, one usually mentions the splitting of the atom, the exploration of space, and computer engineering. Achievements in control theory seem less spectacular when viewed against this background, but the applications of control theory are playing an important role in the development of modern civilization, and there is every reason to believe that this role will be even more signifi- cant in the future. Wherever there is active human participation, the problem arises of finding the best, or optimal, means of control. The demands of economics and technology have given birth to optimization problems which, in turn, have created new branches of mathematics. In the Forties, the investigation of problems of economics gave rise to a new branch of mathematical analysis called linear and convex program- ming. At that time, problems of controlling flying vehicles and technolog- ical processes of complex structures became important. A mathematical theory was formulated in the mid-Fifties known as optimal control theory. Here the maximum principle of L. S. Pontryagin played a pivotal role. 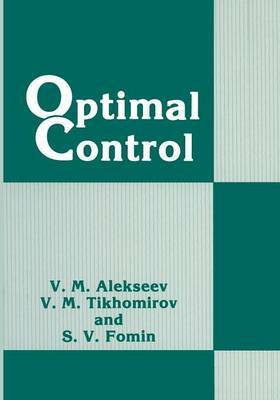 Op- timal control theory synthesized the concepts and methods of investigation using the classical methods of the calculus of variations and the methods of contemporary mathematics, for which Soviet mathematicians made valuable contributions.